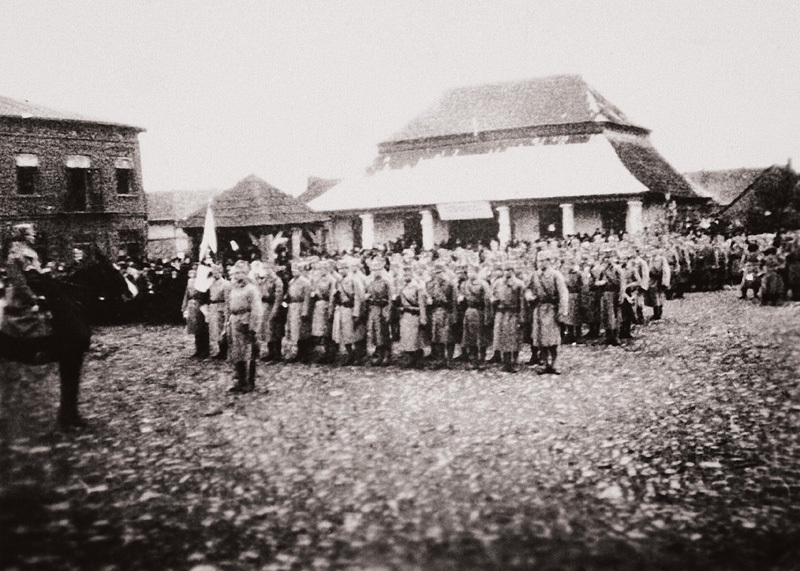 Above: Parade of the Polish Legions (Legiony Polskie) in Sławków, World War I. Photos documenting the life of Polish Legions were taken by one of their soldiers, Jan Zdzisław Włodek. Understood in a traditional way and headed by the master of the house, the family was held in the most esteem. A traditional landed gentry family was a multigenerational one with many children. It was very important to respect the elders, take care of them, and obey them. The value system was based on the Ten Commandments, patriotism, honour, readiness to sacrifice one’s life for the national cause, cult of ancestors, and national traditions. The landed gentry’s motto was “God, honour, fatherland.” Many landowners fought for independence by volunteering to and participating in the national uprisings. During the Polish–Soviet War, the landed gentry financed a voluntary cavalry regiment—the 17th Greater Polish Uhlan Regiment (17. Pułk Ułanów Wielkopolskich), in which they served.